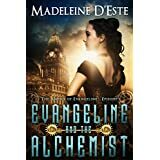 Today, I have the gorgeous Australian author, Madeleine D'Este, for an interview about her book launch of Evangeline and the Alchemist, a novella with a steampunk twist set in 1880s Melbourne. First of all, Madeleine, before we talk about your book, it would be lovely to know a little about yourself. I see from your website bio that you list your interests as 'podcasts, knitting, forteana, indie films, kettle bells and long blacks', so let's hear a little about these pastimes. What kind of podcasts do you enjoy? I do a lot of walking (to counteract the vast amounts of sitting), so I love my podcasts. At the moment, I like writing podcasts e.g. The Creative Penn or So You Want to be a Writer or Science Fiction and Fantasy Marketing Podcast. I also like other non-fiction podcasts on personal development/entrepreneurship, films, health/wellbeing and forteana. I understand 'forteana' is to do with Charles Fort (I remember the Fortean Times when I was younger) - what most interests you about this man, and how does it affect your writing? Not Charles Fort so much but his legacy. I’ve been interested in the “unknown” for as long as I can remember, from aliens, ghosts, folklore and the unexplained. And now, I'm dying to ask, what are 'kettle bells and long blacks' :-D ? Kettle bells are cast iron weights with handles, originally Russian – fabulous for strength training workouts. A long black is a black coffee in Australia, like an Americano but stronger. We take our coffee quite seriously in Melbourne. Let's move to your writing career, and a little about you as an author. What was the first thing you ever wrote, that set you off on your writing path? I might need to check with my mum about this one. I have been dabbling with writing for years and years, with countless unfinished novels in the drawer. I’ve also tried multiple genres, at one time I was trying crime, then urban fantasy but it didn’t seem right. I was doing some soul-searching and realised that writing a novel was my number one goal in life, so I decided to get serious and have a proper crack at this writing thing. I understand you have several other projects than your current release on the go at the moment (I'm sure you're dying to talk about your latest...patience, we'll get there in a minute ;-) ). What are they, and how have you managed to write them? I’m currently querying with a dystopian female-led novel, Return to the Monolith which I wrote with the assistance of an editorial consultant. This is part of a trilogy. I also have seven other episodes of Evangeline in the works. So, now we know a little about you, how about you tell me something about your book, Evangeline and the Alchemist? In 1882, "Marvellous" Melbourne was flush with gold-rush cash and the British Empire’s second biggest city. Evangeline, a seventeen year old reformed urchin and acrobat, is settling into a new comfortable life in Melbourne with her long lost father, Professor Caldicott. But, learning to be a lady is awfully dull. Then, one day, the police arrive, seeking the Professor’s expertise in catching an Alchemist. Is this a chance for Evangeline to test out her new invention and save the day? With regular breaks for tea and cream buns, of course. Cream cakes and inventions, fake gold and kung-fu, Evangeline and the Alchemist is a fun short read, perfect for a flight, commute or lazy afternoon. That does sound fun. Have you any plans to write more about Evangeline? Evangeline and the Alchemist is the first in a series of novellas of mystery and mayhem set in steampunk Melbourne. Other upcoming episodes in The Antics of Evangeline include Evangeline and the Bunyip – where Evangeline faces a mythical Aboriginal monster. I’m planning eight episodes in total. Why Melbourne, and what was it that attracted you to setting the story in 1880s? Steampunk stories are generally set in London but I was inspired by the history I see around me every day. In Victorian times, Melbourne was a major city, hosting the 8th World Fair in 1880. Even today, the streets of inner city Melbourne are filled with grand sandstone buildings and houses from this era. I wanted to explore Victorian sensibilities in the Colonies, the clash of classes and cultures in the new world and the ridiculousness of wearing full coverage dresses with bustles in 40’C summers. All with a dash of science fiction fun. Steampunk creates an alternate world where Victorian innovations are taken to new heights and fun inventions are inserted alongside the Victorian clichés of parasols, whiskers and London pea-soup fogs. Cool, so now we know a little about it, where can we find Evangeline and the Alchemist? It's now available on Amazon and through Kindle Unlimited. Thank you so much for taking the time to join us, Madeleine.